with Pseudopolyides furcellarioides, North of Spain, 2007. Ignacio Bárbara. © Ignacio Bárbara (barbara@udc.es). microcope, transverse seccion, Brittany, France, 2001. Ignacio Bárbara. © Ignacio Bárbara (barbara@udc.es). 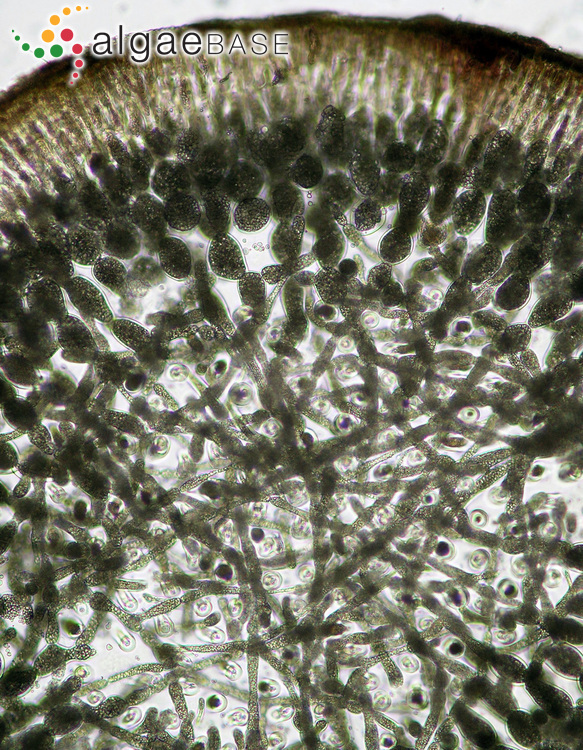 microcope, with gonimocarps, Brittany, France, 2001. Ignacio Bárbara. © Ignacio Bárbara (barbara@udc.es). microcope, longitudinal seccion, Brittany, France, 2008. Ignacio Bárbara. © Ignacio Bárbara (barbara@udc.es). microcope, transverse seccion, North of Spain, 2007. Ignacio Bárbara. © Ignacio Bárbara (barbara@udc.es). 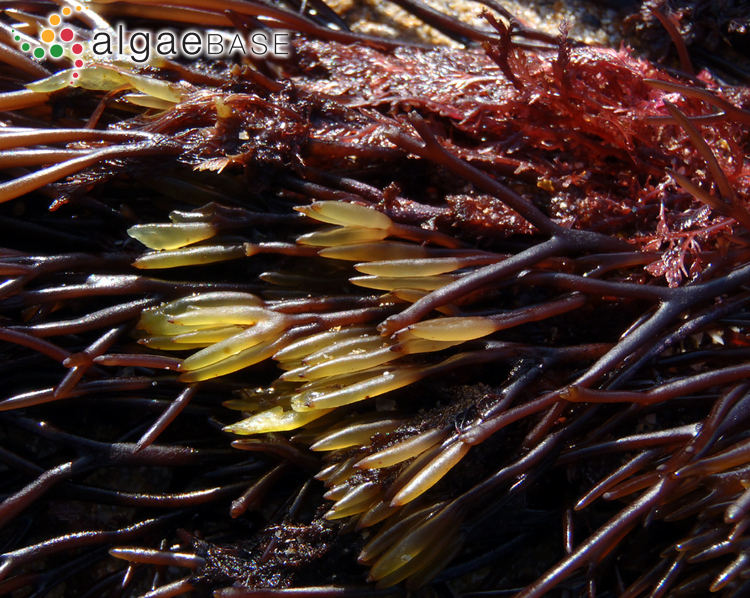 lower intertidal, male plants, Brittany, France, 2011. Ignacio Bárbara. © Ignacio Bárbara (barbara@udc.es). lower intertidal, Brittany, France, 2011. Ignacio Bárbara. © Ignacio Bárbara (barbara@udc.es). This is the type species (holotype) of the genus Furcellaria. Type locality: [unlocalised; certainly England] (Hudson 1762: 471). Lectotype: BM (Dixon & Irvine 1977: 181). Notes: An undated, unlocalized Hudson specimen accepted provisionally as of lectotype status by Dixon & Irvine, 1977: 138 (Dixon & Irvine, 1977: 181). Adjective (Latin), worm-shaped (Stearn 1973). English: Clawed Fork Weed (Bunker et al. 2010). Swedish: Kräkel (Tolstoy & Österlund 2003). English: Black Carrageen (Brennan 1950). Gaeilge: Crúba préacháin, Leaba portáin (Brennan 1950), Leaba phortáin (Anonymous 1978). 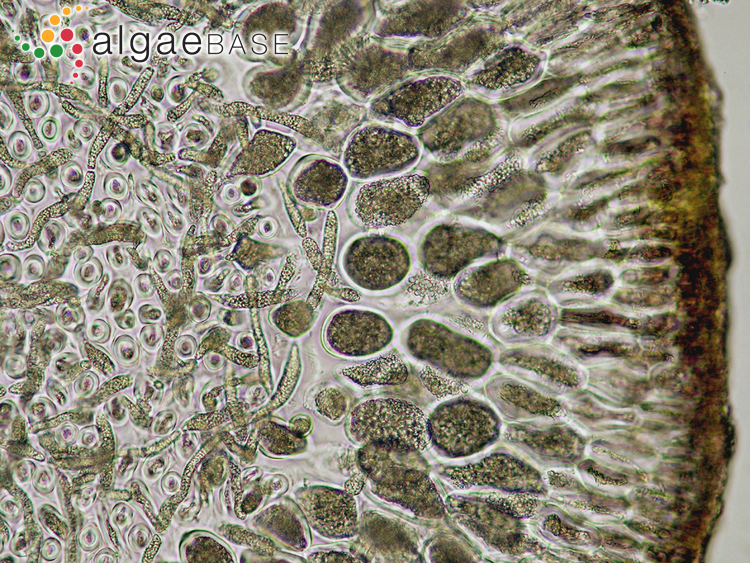 Cartilaginous, cylindrical, brownish-black fronds, repeatedly dichotomously branched, fastigiate, to 2 mm diam. 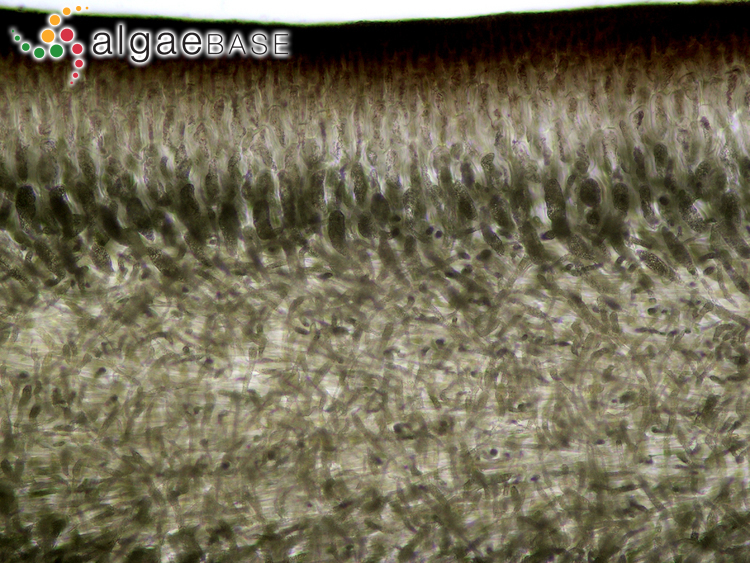 and 300 mm long, with acute apices. Attached by much-branched rhizoids. 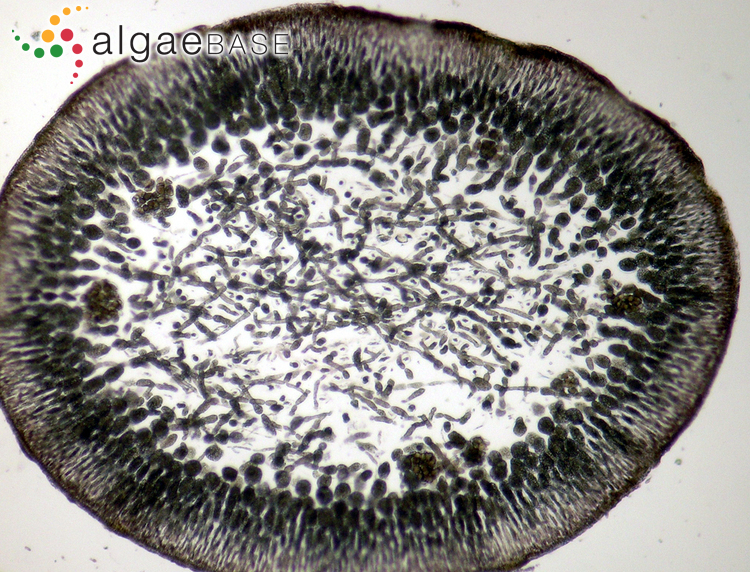 Multiaxial, medulla of cylindrical cells interspersed with rhizoids, cortex of irregular filaments, inner cells elliptical, outer cells narrow, elongated, in radial rows. On rocks, lower intertidal and shallow subtidal, in pools and runnels, in open situations, often on sandy and muddy shores, tolerating lowered salinities. Generally distributed, common. Austin, A.P. (1960). Life history and reproduction of Furcellaria fastigata (L.) Lam. 2. The tetrasporophyte and reduction division in the tetrasporangium. Annals of Botany, New Series 24: 296-310. Austin, A.P. (1960). 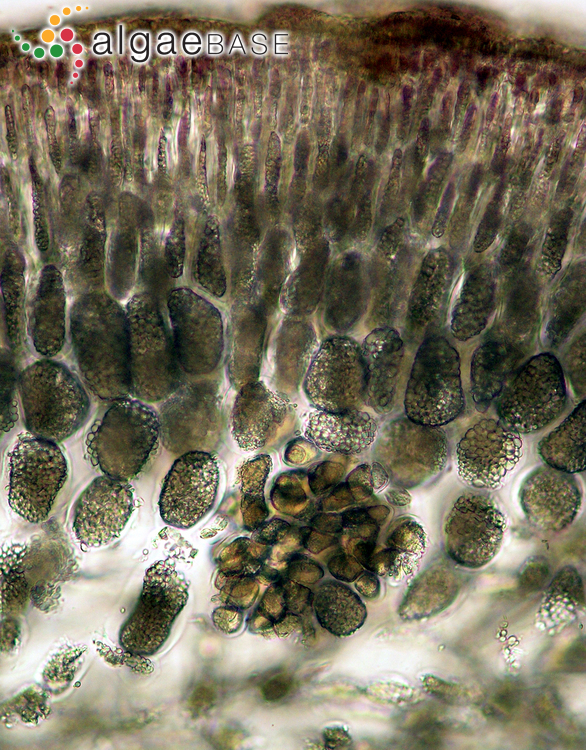 Life history and reproduction of Furcellaria fastigiata (L.) Lam. 1. The haploid plants and the development of the carposporophyte. Annals of Botany, New Series 24: 257-274. Austin, A.P. (1960). Observations on the growth, fruiting and longevity of Furcellaria fastigiata (L.) Lam.. Hydrobiologia 5: 193-207. Kostamo, K. & Mäkinen, A. (2006). Observations on the mode and seasonality of reproduction in Furcellaria lumbricalis (Gigartinales, Rhodophyta) populations in the northern Baltic Sea.. Botanica Marina 49(4): 304-309, 4 figs, 4 tables . Larsen, A. & Sand-Jensen, K. (2005). 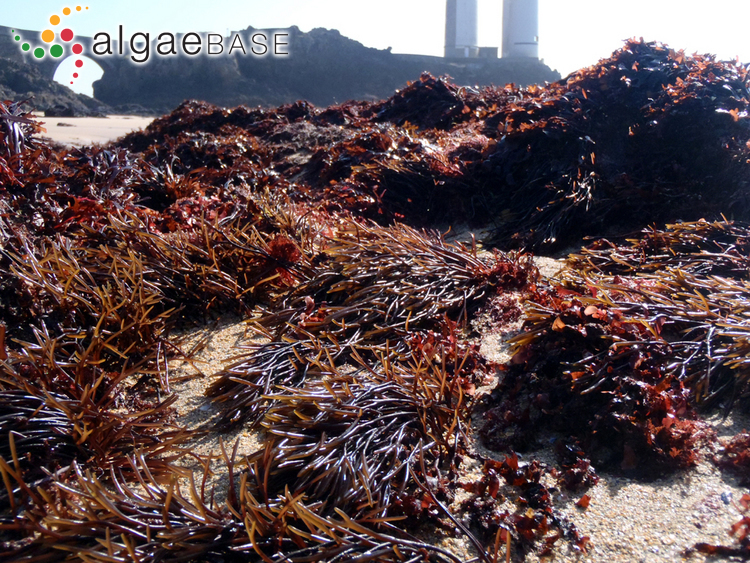 Salt tolerance and distribution of estuarine benthic macroalgae in the Kattegat-Baltic Sea area. Phycologia 45: 13-23. Accesses: This record has been accessed by users 18301 times since it was created. Barwell, C.J. (1983). The distribution of histamine in Furcellaria lumbricalis. British Phycological Journal 18: 200. Barwell, C.J. (1989). Distribution of histamine in the thallus of Furcellaria lumbricalis. J Appl Phycol 1: 341-344. Bird, C.J., Saunders, G.W. & Mclachlan, J. (1991). 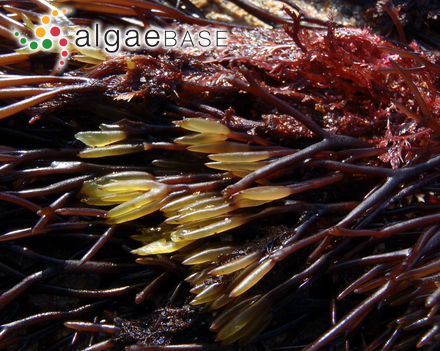 Biology of Furcellaria lumbricalis (Hudson) Lamouroux (Rhodophyta, Gigartinales), a commercial carrageenophyte. Journal of Applied Phycology 3: 61-82. Blunden, G., Smith, B.E. & Cary, P.D. (1989). Trans-4-hydroxy-ß-prolinebetaine, a new betaine from Furcellaria lumbricalis. J Appl Phycol 1(1): 1-4. Holmsgaard, J. E., Greenwell, M. & McLachlan, J. (1981). 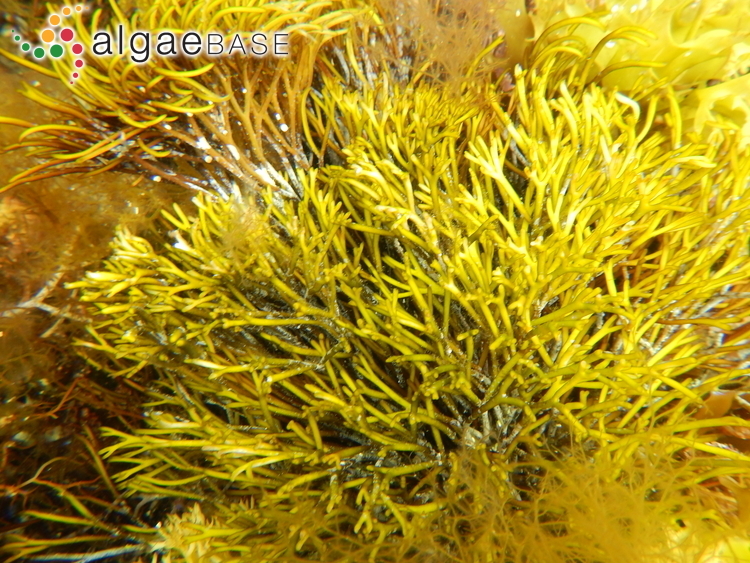 Biomass and vertical distribution of Furcellaria lumbricalis and associated algae. Proceedings of the International Seaweed Symposium 10: 309-314. Indergaard, M. & Knutsen, S.H. (1990). Seasonal differences in ash, carbon, fibre and nitrogen components of Furcellaria lumbricalis (Gigartinales, Rhodophyceae), Norway. Botanica Marina 33: 327-334. Kersen, P., Paalme, T., Pajusalu, L. & Martin, G. (2017). 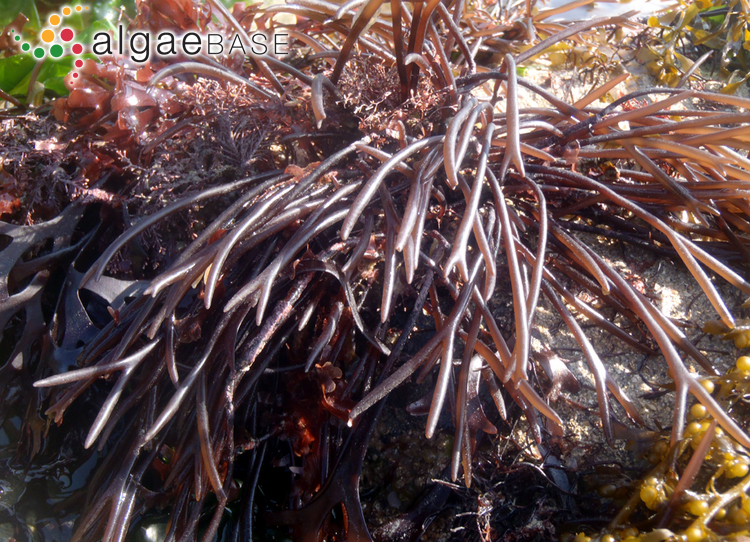 Biotechnological applications of the red alga Furcellaria lumbricalis and its cultivation potential in the Baltic Sea. Botanica Marina 60(2): 207-218. Knutsen, S.H. & Grasdalen, H. (1987). Characterization of water-extractable polysaccarides from Norwegian Furcellaria lumbricalis (Huds.) Lamour. (Gigartinales, Rhodophyceae) by IR and NMR spectroscopy. Botanica Marina 30: 497-505. Knutsen, S.H., Myslabodski, D.E. & Grasdalen, H. (1990). Characterization of carrageenan fractions from Norwegian Furcellaria lumbricalis (Huds.) Lamour. by 1H-n.m.r. spectroscopy. Carbohydrate Research 206: 367-372. Korolev, A., Kuznetzova, T.A. & Drozdetsky, V.G. (1993). Investigations of the Furcellaria lumbricalis distribution and abundance at the eastern coast of the Baltic sea. Proc. 13th Baltic Mar. Biol. Symp. : 9. Maekinen, A., Kaeaeriae, J. & Rajasilta, M. (1988). Factors controlling the occurrence of Furcellaria lumbricalis (Huds.) Lamour. and Phyllophora truncata (Pallas) Zinova in the upper littoral of the archipelago of S.W. Finland. In: The Baltic Sea Environment: History, Euthrophication, Recruitment, Ecotoxicology. (Theede, H. & Schramm, W. Eds) Vol.6, pp. 140-146. Kieler Meeresforsch. Martin, G., Paalme, T. & Torn, K. (2007). Seasonality pattern of biomass accumulation in a drifting Furcellaria lumbricalis community in the waters of the West Estonian Archipelago, Baltic Sea. Proceedings of the International Seaweed Symposium 18: 331-337. Mikulich, D.V., Voloshchenko, I.A. & Medvedeva, E.I. (1988). The jelly-forming capacity of polysaccharides from the red algae Furcellaria lumbricalis (Huds.) Lamour. and Phyllophora truncata (Pall.) Newroth et Taylor (the Bight of Kassari of the Baltic Sea). Rast. Resur. 24(3): 456-460. Novaczek, I. & Breeman, A.M. (1990). Thermal ecotypes of amphi-Atlantic algae. II. Cold-temperate species (Furcellaria lumbricalis and Polyides rotundus). Helgoländer Meeresuntersuchungen 44: 475-485. Tuvikene, R., Truus, K., Robal, M., Volobujeva, O., Mellikov, E., Pehk, T., Kollist, A., Kailas, T. & Vaher, M. (2010). 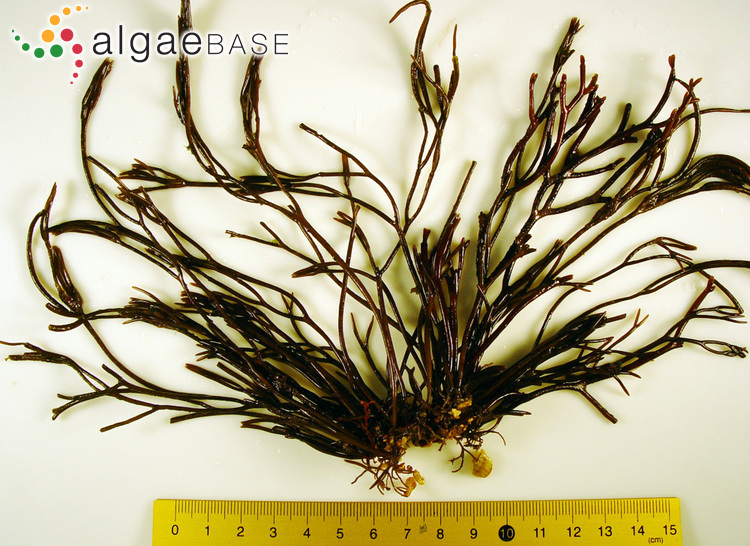 The extraction, structure, and gelling properties of hybrid galactan from the red alga Furcellaria lumbricalis (Baltic Sea, Estonia). Journal of Applied Phycology 22: 51-63. Valatka, S., Mäkinen, A. & Yli-Mattila, T. (2000). Analysis of genetic diversity of Furcellaria lumbricalis (Gigartinales, Rhodophyta) in the Baltic Sea by RAPD-PCR technique. Phycologia 39: 109-117.